HA HA paints Singapore — ARTIVIST : creative by any means necessary! The history and legend of infamous Australian outlaw Ned Kelly is being recognised with a stunning exhibition of art on display at the Australian High Commission in Singapore until the end of October. The ‘LOADED’ exhibition, curated by Gabrielle Cummins from Australasian Arts Projects, includes a collection of pieces by six Australian artists, Sidney Nolan, Adam Cullen, Regan Tamanui, Camie Lyons, Melanie McCollin-Walker and Joanna Logue. The High Commissioner Philip Green hosted an intimate gathering acknowledging the outstanding work of the artists, with work from the exhibition moved to the residence for the event. 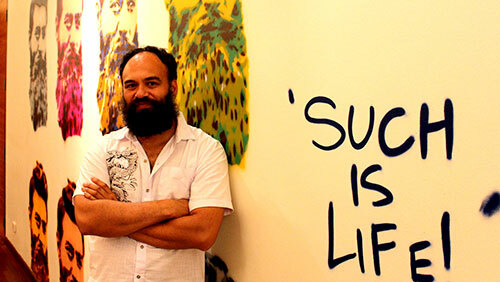 In what is sure to be a very unique situation, Mr Green invited Tamanui (aka 'Ha Ha') to graffiti one of the walls in the dining room at the residence. The result is magnificent piece of artwork that had guests at the event captivated.